Raphael’s Small Cowper Madonna mirrors the style and mood of those from Perugino’s shop. But compare these two Madonnas. While the Virgins share a graceful modesty and wistful expressions, the two paintings differ compositionally. 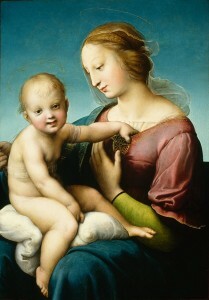 Raphael’s figures are tied by interlocking gestures and unified by their shared gaze to a vision of the child’s future. By contrast, Perugino’s recycling of stock figures from workshop repertoire sometimes resulted in figures that are unrelated or gestures that are unexplained by the story being told. Was the child here meant to hold something, as he perhaps did in another painting? 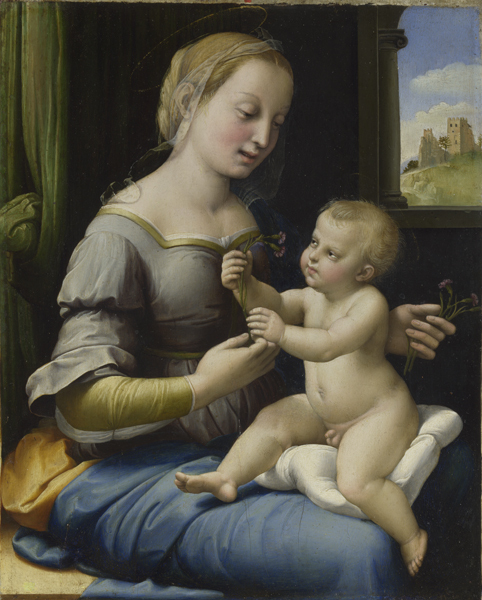 Unlike Raphael’s mother and child, who form a seamless unit, Perugino’s seem to exist in separate worlds. After studying with his father in Urbino and working in the busy shop of Perugino, Raphael moved to Florence. During his few years there, between 1504 and 1508, he is known to have painted at least seventeen small devotional panels of the Virgin and Child. 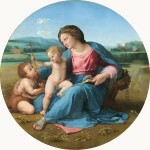 He likely made most for an avid market, but it appears that Raphael had more than a commercial interest in the image. He gave three—one as a wedding present—to friends. (Paintings of the Virgin and Child were popular wedding gifts.) He also made drawings of the Mother and Child that he never translated in paint; they seem, instead, to be personal explorations. From Raphael’s entire brief career some thirty-four paintings of the Virgin and Child survive. The artist’s mastery developed as he absorbed the lessons of not only his first teachers but also Leonardo and Michelangelo and the ancient art he saw in Rome. The grace of Raphael’s Madonna paintings—their idealized beauty and tender sentiment—came into harmony with their subtly constructed meaning. This tiny panel (measuring only 9 inches across) shows the Virgin and Child in a bedroom—the curtain of a bed appears behind her. In all likelihood the owner, possibly sitting in her own bedroom, would have held the panel in her hand as she contemplated it and made her devotions. Linking the two figures are the flowers they pass between them—pinks, which because they were symbols of marriage, point to the Virgin as not only the mother but also the bride of Christ. This may be the last work Raphael painted in Florence before departing for Rome. 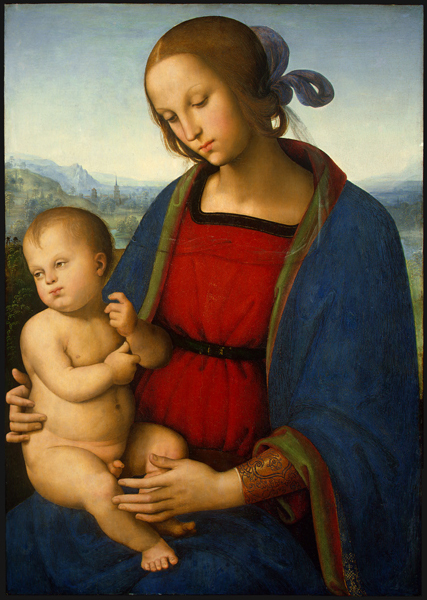 Superficially perhaps, it seems close to Perugino’s Madonna, yet it is more complex even than Raphael’s own Small Cowper Madonna made only a few years before. Here the child tugs at his mother’s bodice, wanting to nurse. (Raphael’s signature appears in the gold embroidery at her neckline.) The two figures are closely related, physically and psychologically, through their poses and intimate action. Their large bodies nearly fill the frame, concentrating the viewer’s attention on them. Although they are depicted in a tender, maternal moment, their size imparts monumentality and gravity. The infant has imposing presence despite his playfulness. Notice, too, a softening of Raphael’s palette to more muted tones. With Leonardo and Michelangelo, Raphael is one of a triad of artists who epitomize the high Renaissance, a brief moment when a timeless, classical style produced a harmonious balance of form and meaning. It was a point at which Raphael arrived through study and assimilation. Leonardo’s influence is seen in the easy way Raphael’s figures relate to the landscape around them and to one another, and in the way that relationship is a part of the “story” being told. Raphael had stood “marveling and amazed,” Vasari wrote, because the “manner of Leonardo please[d] him more than any other he had ever seen.”19 Leonardo’s presence in Florence, in fact, had first drawn the young Raphael there. After the pope called Raphael to Rome—and thanks to Michelangelo’s temporary absence from that city—Raphael had been able to study the Sistine Chapel frescoes in progress. The impact of the frescoes is seen in the increased monumentality and robustness of Raphael’s figures and a more energetic, physical style.